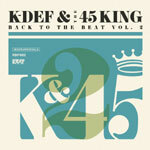 By popular demand, K-Def and The 45 King team up once again for another full length of continuous, golden era style instrumentals. Fans of the first won't be disappointed as volume 2 grabs the baton without missing a step. If you've followed the legendary 45 King since the 80's, his contributions on Back to the Beat Volume 2 are very assuring that after almost 3 decades and pioneering in rap production his signature sound is well intact. Complementing 45 King's selections, K-Def, a legend in his own right with massive discography dating back to the early 90s, used this album as an opportunity to have fun and venture away from the darker complex arrangements he is known for on his own, hence the album title. 15 tracks of bright and upbeat seamless grooves, perfect for listening anywhere, any day, at anytime. Volume 1 sold out quickly this release will likely move even faster. Collectors, don't sleep. Volume 2 of Back to the Beat may not be back for too long.